You worked overtime (or over-volunteered), got drenched in a downpour running into the grocery store for dinner because everyone’s screaming,” what’s for dinner?” and, when you finally get home, walk into a house that’s a mess, disorganized, in disrepair and just plain sad. You had the exact same stressful day. overtime/over-volunteering, soaking wet, carrying bags of groceries and, when you finally get home, walk into your home and automatically take a deep breath. This can be your reality (no matter how grand or modest your house is). Where can you breathe—really breathe? What energizes you and allows you to decompress? Where do you feel calm; at peace? The ideal answer would be “at home.” Unfortunately, for many, that’s not the situation at all. And, (this is important) you are not spiritually or emotionally equipped to be your best person if you can’t be that in your own home. Imagine that you walking through your door and the first thing you see is a piece of art that reminds you of a place you love (it can be your own back yard). You smile, take off your shoes, put them where you do, intentionally, every day. You walk into the kitchen and put the groceries on the pristine counter. There’s nothing there except a small, beautiful plant–no mail or dirty dishes or things that need to be fixed. After all, it’s your kitchen counter; the place where you feed your body. You turn on smooth jazz (or indie rock or country)—music that feeds your soul. You look around. Everything is serene There’s no clutter anywhere because you take care of things before they can become clutter. When I’m teaching Organization, Design or Feng Shui, it’s always about how we live in our spaces. After being in a place long enough, most people don’t see what’s all around them—it’s “wallpaper”; simply part of the background. Eventually, we become so used to “how it is” that we forget “how it can be”. 1. Are you using each room (moving energy around your house) or are there vacant spaces that never see any activity? 2. What’s your “sightline” (the first thing you see) in each room? 1. Decide what’s in your home that doesn’t make sense for you. A home that’s wrapped in peace does not have to be a house void of things of this world. I believe that God wants us to enjoy life, to live harmoniously, and to (within reason) reap the rewards of our labors—and for most humans that includes possessions. 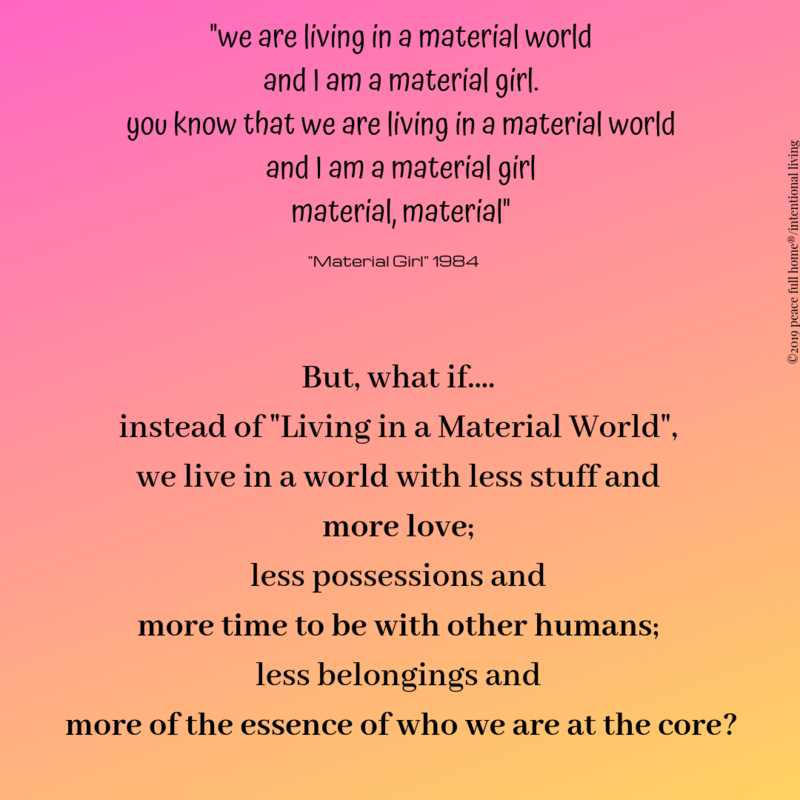 The problem comes in when we don’t even know what we have (or where it is); when the “stuff” of life takes over the living of life; when we’re living in Madonna’s, 1984 song, “Material Girl”. If you’re stuck in a “material world”; where every corner is filled, but your house feels “empty”, it may take time for the evolution to peace-filled living to take place. 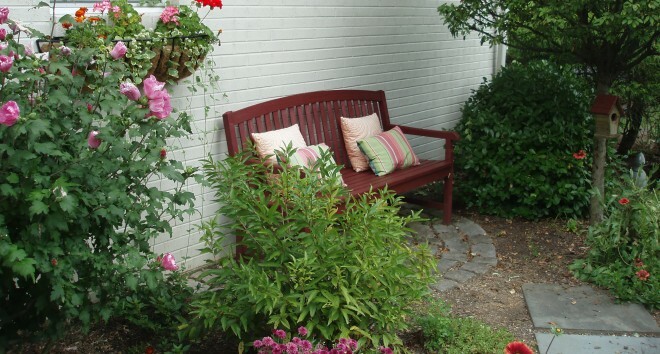 But, the payoff—the ability to live in a calm, serene, nurturing environment—is worth the effort. You’re worth the effort. Marrying the Material World to a Peaceful Home is not impossible. It may take baby steps, but you can get there. Peace Full Home is about creating a life that feeds your spirit—a life that acknowledges the value of each moment. “Home” is not only where we reside. Home is how we walk through life and, often, that starts with the building we spend the most time in. This entry was posted in Creating a Peaceful Home, Food For Thought, Home, Living Your Best Life, Peace Full Home/Intentional Living and tagged Home, home as sanctuary, Madonna, Material Girl, materialism, possessions. Bookmark the permalink. I am fully retired now and people ask will I travel or move or volunteer etc. This post (and the one about the sock on the TV) hits home for me because my big plan is to declutter my house! (I can see you cringing) It may take years but I’m committed. My son actually said I have enough ‘stuff’ to open an Amazon warehouse. Sad but true! Hope you are well. Wish me luck! I am definitely not cringing at all. Most of the clients I work with have so many belongings that they really don’t know what they own. You are definitely in the majority. What’s awesome is that you realize it and want to make a change! Thank you, Val. There’s so much we “miss” as we run through life and, often, what we miss is living with intention and creating homes that “feed” rather than deplete us. Love right back to you!